AMERICA IS STRESSED | Stress is defined as a state of mental or emotional strain or tension resulting from adverse or very demanding circumstances. While some may thrive in stressful situations, many wither. Nearly three-quarters (72 percent) of adults report feeling stressed about money at least some of the time. 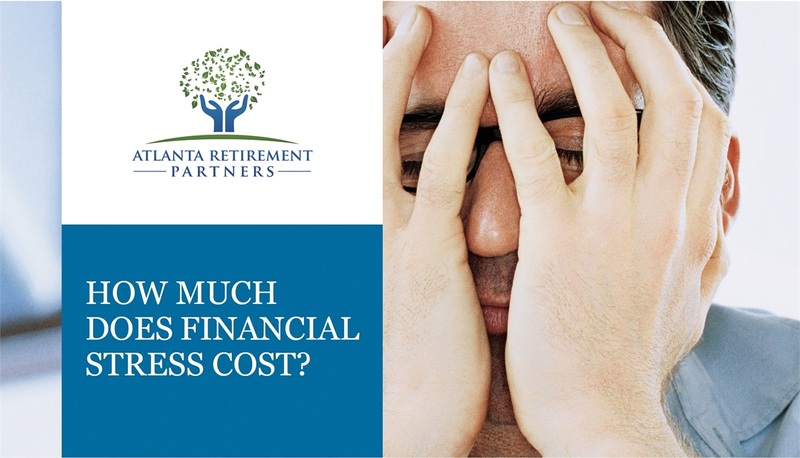 Work related stress and financial stress top the charts of stressors and this can affect many facets of your business. The World Health Organization has dubbed stress the health epidemic of the 21st century and estimates that workplace stress costs American businesses up to $300 billion a year! FINANCIAL STRESS AND PRODUCTIVITY | According to an annual study by PWC, the number of people reporting financial stress has been on the decline until this year. In fact, more than half (52%) of employees report that they find dealing with their finances stressful, up 7 percent from last year. The same study shows financial challenges cause employees the most stress in their lives, impacting their health, relationships, productivity, and time away from work. 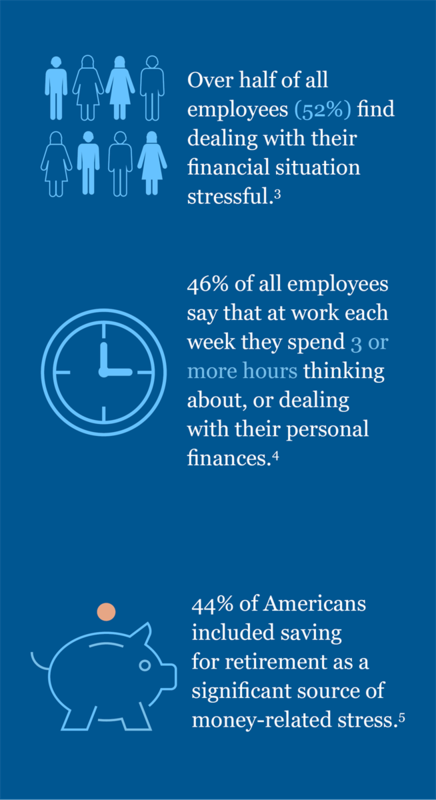 46% of all employees say that at work each week they spend three or more hours thinking about, or dealing with, issues related to their personal finances. In other words, nearly half of your full-time workforce may be spending 156 hours or nineteen and a half days a year distracted from work because of personal finance issues. HEALTHCARE COSTS | We’ve seen that the level of stress reported by employees is increasing and so is the cost of health care. Is there a connection? The physical repercussions of stress are clear to see; they can weaken the immune system making one more susceptible to illness which could have an impact on healthcare costs. Another less obvious possibility for stress production is retirement. 44% of Americans include saving for retirement as a significant source of money-related stress. This a real concern. Many Americans delay retirement due to lack of savings and this delay could annually cost employers over $5,000 per employee in health insurance premiums. WELLNESS PROGRAMS | More companies are jumping at the chance to promote a healthy lifestyle amongst their workforce. In 2015, 7 out of 10 companies offered wellness programs as a part of their benefits package. As companies explore more holistic ways of increasing productivity and reducing healthcare costs, more programs are being offered to incorporate financial wellness along with physical health. According to research by Aon Hewitt, roughly two-thirds of all respondents indicate that they have a financial wellness strategy, with a majority of plan sponsors having separate financial wellness and physical well-being approaches. One-quarter of all employers include financial wellness as a pillar of a broader wellness program that includes physical health. SUPPORT CUTS STRESS | Creating a happy, healthy workplace is a difficult task. By providing a comprehensive benefits package, you are taking steps to enrich the lives of your employees. Your corporate benefit package should be a tool for attracting and retaining top talent, not a source of stress. An all-inclusive plan should incorporate components that aim for well-being in all areas including physical heath, financial wellness, retirement readiness, and a healthy work-life balance. By working with a professional advisory team that operates under a fiduciary standard, you can reduce your own stress knowing that your best interests are always top of mind and you can get back to focusing energy on supporting your team. Which is why, we at Atlanta Retirement Partners believe that employees come first. We strive to engage your workforce to save a meaningful amount into their retirement savings vehicles. We partner with employers to understand the employer benefits of financially healthy employees. Many employees look to their employers for guidance on savings levels, so we work to understand your employee population, plan design options, and organizations goals to offer tailor advice. For more information on our retirement plan services and how we strive to reduce employer fiduciary risk, while working to increase financial wellness and retirement outcomes. Brun, Jean-Pierre. “Work-related Stress : scientific evidence-base of risk factors, prevention and costs.” World Health Organization. 2006. PricewaterhouseCoopers LLP. “Employee Financial Wellness Survey” (2016): Pg. 7. PWC. April 2016. American Psychological Association. “Stress in America. Paying with Our Health” February 2015. "Aon Hewitt Analysis Shows Upward Trend in U.S. Health Care Cost Increases." Aon Hewitt, Nov. 2014. SHRM Research Report. “Employee Benefits” (2015): Society for Human Resource Management. 2015. Aon Hewitt plc. “Hot Topics in Retirement” (2015): Pg 5. Aon Hewitt. 2015.